No tickets are required. The event programme is free of charge, except for purchases from commercial vendors at the Market Place (food) of course. Apart from the normal Ormeau Park car-parking provision, there will be no car-parking facilities at the event site itself. As Ormeau Park is in the middle of several residential areas we advise all attending that there is likely to be only limited on-street parking in the vicinity and therefore you may wish to consider travelling on foot, bicycle or via public transport. The park is accessible via entrances on Ormeau Road, Ormeau Embankment, Park Road or Ravenhill Road. If travelling by bus take Translink Metro No. 7A-D from Belfast City Centre and get off directly outside the Ormeau Road entrance of the park. 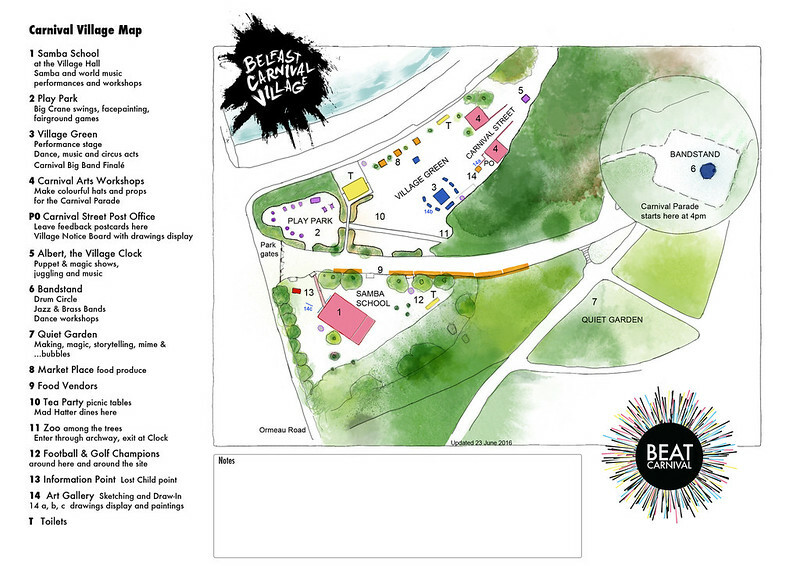 The BCV event site will be located just inside the Ormeau Road entrance. Most of the programme activity areas are on the park grass. The individual sites are fairly flat but the overall location is on a hill, between the Bandstand and the main Village Green. The marquees will have hard floors and the biggest marquee, the Samba School, will have a board path connecting it to the park avenue. There is a tarmac path to the main toilet block. There will be wheelchair accessible toilets at the two portaloo locations.